Major Frank C. Stolz is a retired Marine Corps Officer who served 20 years in the Corps, much of that overseas. 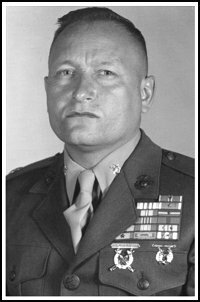 A Vietnam veteran, he commanded Marine Rifle Platoons and a Rifle Company in combat, later holding duties as an Advisor to Republic of Vietnam (RVN) Forces. His duty assignments also included tours at HQMC, the Pentagon, and the Military Assistance Advisory Group, China. Upon retiring in 1979, Major Stolz worked in Saudi Arabia for 13 years with the Aramco Oil Company, followed by five more years in other Middle and Far Eastern nations, during which he began on-going studies of the Islamic religion and Muslim society and culture. Now retired, he resides in Texas where he spends his time building rental properties in Texas and writing commentary, primarily on military and political issues. He is a graduate of San Diego State University. I have been genuinely resistant to posting this Citation, principally because my Marines also exhibited all the qualities attributed to me in this award. Without them this Citation would not exist. I have only reluctantly been persuaded by others, of the recognition this will bring to my brave comrades from 3rd Platoon; A Company; 1st Battalion; 1st Marines. Especially those who paid the ultimate price and did not survive. They will always be foremost in my heart and mind and I dedicate this Citation to them! This citation and other files on this site require Adobe Acrobat Reader. Click here to get it free. Or don't they really care? Copyright 2005 - Frank C. Stolz, Jr.